A fascinating discourse between two of this medium's greatest contributors — comics legend Will Eisner and Sin City creator and co-director Frank Miller. It would be hard to imagine any creators who have affected their chosen medium more than Eisner and Miller have influenced the world of comic books and graphic novels. Now, life-long comics fans and culture-curious readers are invited to listen in as a legendary innovator and godfather of sequential art (Eisner) and the modern master of cinematic comics storytelling (Miller, who would go on to direct The Spirit feature film) discuss one-on-one, in an intimate interview format, the ins-and-outs of this absorbing and often controversial art form. 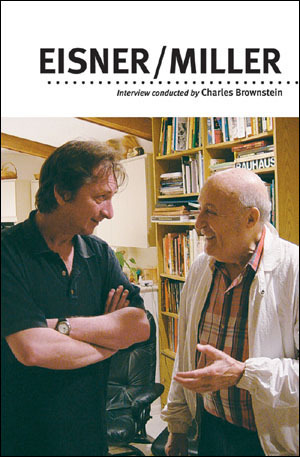 Eisner/Miller is widely illustrated and features rare, behind-the-scenes photos of Eisner, Miller, and other notable creators.